A homeless woman who had suffered multiple losses and was not taken seriously by those around her, a man who had lost his wife and mother during the same year, fire-fighters and others on the front lines of traumatic events, these were the stories told by Janet Childs at the April 18 Pizza & Prose event in Capitola. A packed house listened intently as she wove a tapestry of the grieving and healing process with her wise words and soothing music. As the Director of Education at The Centre for Living with Dying, Janet has been on the front lines, working with and debriefing police, fire-fighters, doctors, and others who are all too often expected to deal with the most traumatic and unimaginable situations with strength, calm, and resilience. She has worked with the group, Parents of Murdered Children, which supports loved ones in the aftermath of trauma beyond comprehension. Young and old, sudden deaths and long illnesses, whatever the circumstance, Janet has been a saving grace in the true sense of those words for so many. Janet spoke to the heart of what we do as writers, we give voice to the truth or at least that is when we are at our best and in our groove. In grief, however, that truth can be very difficult to look at. People often cringe at words like death and dying. 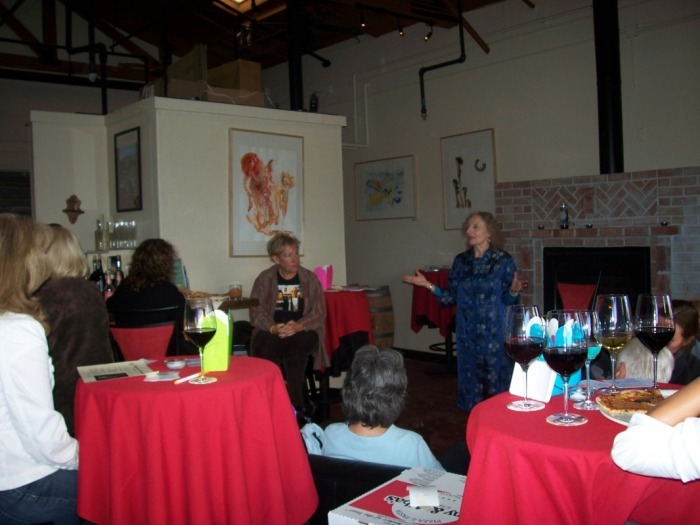 Yet, on a Wednesday evening in April to a packed house at a cozy wine bar, people sat quietly and listened, some even shared their own story. A mother who had lost a son, a woman facing a serious surgery in the very near future, yet another coping with the loss of her father and the lessons she has learned about grief from her very young son. In between these stories Janet played guitar and sang the songs she has written over the years about life and death, pain and healing. 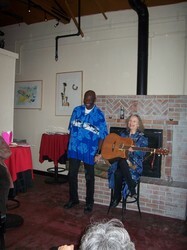 At times the audience joined in on the chorus. One song in particular was dedicated, as a candle was lit, in memory of those students lost this week at Virginia Tech University and of the loved ones lost to those in attendance. Janet was joined on many of these songs by the amazing deep and gentle voice of Ronnie Grigsby, himself a testament to the ability of the human spirit in the face of much loss. Their voices rose and fell together in such sweet and moving harmony. The last song which they sang a capella was riveting. Ronnie sang Sometimes I Feel Like A Motherless Child written by Harry Thacker Burleigh, while Janet weaved in the words to Amazing Grace behind him. It was a powerful end to a wonderful evening. Many thanks to Cava owners, Zach Worthington and Cliff Livinston, for providing the space for this event. They are truly exceptional people. Thanks to Caruso’s Italian Cuisine for allowing our audience to order food at their restaurant next door and then serve us at Cava. Thank you to the Local Chapter of the National Writer’s Union and the Central Coast Branch of the California Writer’s Club for co-sponsoring this event. Last, but certainly not at all least, a very heartfelt thank you to Janet Childs for a truly special and moving evening and for introducing us to Ronnie.